Yesterday afternoon, while taking care of some business in the city, we made a pit stop for Rowan at the toy store. While we browsed, she spent some time playing with their train track and trains. 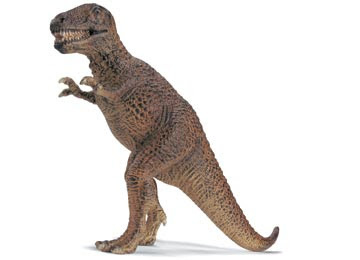 While browsing, Andy found the Schleich toys and passed me the Tyrannosaurus Rex. Rowan is very interested in dinosaurs but has a distinct dislike for the 'Tyrannosaurus Ex' (and watching the Land Before Time courtesy of Grandma didn't help~ the 'Sharp Tooth' really frightened her). The T-Rex had a moveable jaw and was pretty darn cool, so I took him over to Rowan and the trains. She was s absorbed she didn't notice me, so I 'roared' and placed the T Rex right in front of her train. Well, the poor thing shrieked, clutched her train to her chest and yelled "Get THAT OFF OF THERE!" as she leapt back about two feet in horror. Bad, bad mommy. I started to laugh. She looked at me, mystified, as I tried to assure her it was just a toy (and yes, apologized!). "Stands on two legs. Tiny front legs. Sharp meat eating teeth." And then she giggled and declared "There was a Tyrannosaurus Ex on my train track!" Hopefully not scarred for life by her evil mother (but hey, I learned it from *my* mother! ).